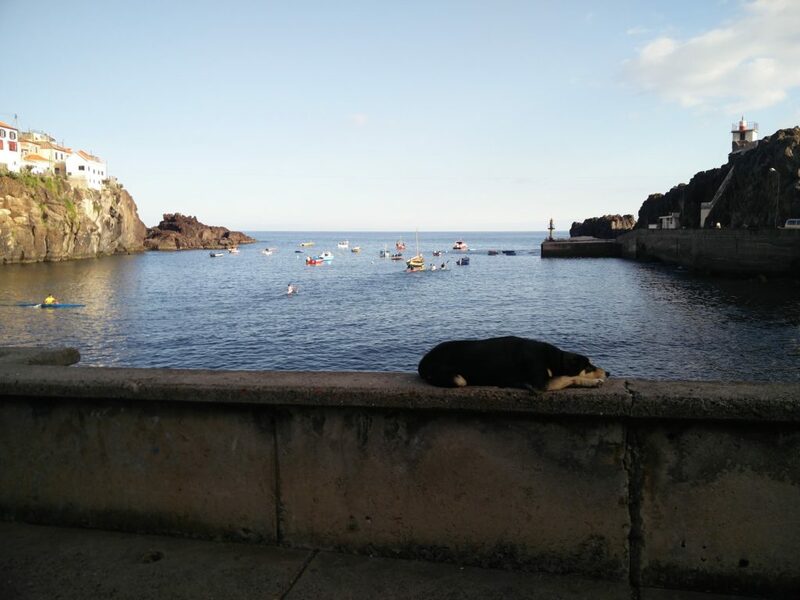 In May 2018, three scholars met on the Portuguese island of Madeira to discuss the perspectives we bring to our work in STS and adjacent fields. Intending to undertake 10 days of exploratory “rapid” research in this particular field site, relying on “walkshops” and ethnographic participant observation, we instead emerged having shot two 360-degree “immersive” documentary films and attempted the aerial mapping of a key site with a kit provided by a citizen science non-profit. Coming from different fields—contemporary art and curating (Michelle Kasprzak, University of Porto/Madeira Interactive Technologies Institute), journalism and digital media (António Baía Reis, University of Porto), ethnography and innovation studies (Justin Pickard, University of Sussex)—we three authors were united by an interest in what rapid, collaborative, and experimental research approaches could bring to an interrogation of questions around landscape, inclusion, digital technology, and imagined futures. In this, the “edge” of the title denotes Cabo Girão, a set of cliffs on Maderia’s southern coast looking out over the Atlantic, and, by extension, the island’s peripheral status. While our time in the field was limited, we found ourselves focusing on how these thematic concerns—questions which have animated our research elsewhere—are inflected by Madeira’s location on the outermost edge of Europe, an autonomous region of Portugal, but with a common colonial maritime history. Fig. 1: Bay of Câmara de Lobos, 9 May 2018. This experiment took place in the interstices of Kasprzak and Baía Reis’s respective doctoral research projects. Kasprzak’s work was already well underway, working with at-risk youths in Malvinas, a bairro in the fishing community of Câmara de Lobos, on Madeira’s south coast. Involving these young people in practices of art-making, and working in close collaboration with a Madeira-born artist, her research looked at the role of curation in helping articulate local sociotechnical imaginaries (Jasanoff and Kim, 2009)—the visuals, symbols, shared understandings that influence the behaviour and decisions of members of this particular community. With Kasprzak’s research as a backdrop, Baía Reis was using a multi-lens Vuze camera to capture 360-degree video footage, material for a couple of short “immersive documentary” films that would be experienced online or through wearable virtual reality headsets. In pursuing this goal, his overriding concern was with the kind of narratives that would be best suited to this emerging visual medium, arriving prepared with some ideas and “leads” regarding what to shoot in mind. With this coincidence of individuals and research projects, and inspired by a list of provocative prompts on “experimental” ethnography from media anthropologist Gabriele de Seta (2017)—variously relaxing, reworking, or breaching the conventions of ethnography as method and genre—saw an opportunity for some wider methodological experimentation. Where much established STS ethnography would stretch for longer durations, often relying on the efforts of a single researcher, we asked what it could mean to work rapidly, at speed, drawing on the observations and products of three people. Writing on short-term ethnography as a research practice characterised by its “intensity”, Pink and Morgan (2013) borrow from design, corporate ethnography, and applied research to discuss how researchers can use more “interventional as well as observational methods”, working in ways that could be too intrusive to sustain over longer time frames. In our work in Madeira, much of this intensity came from being able to join in media res. Fig. 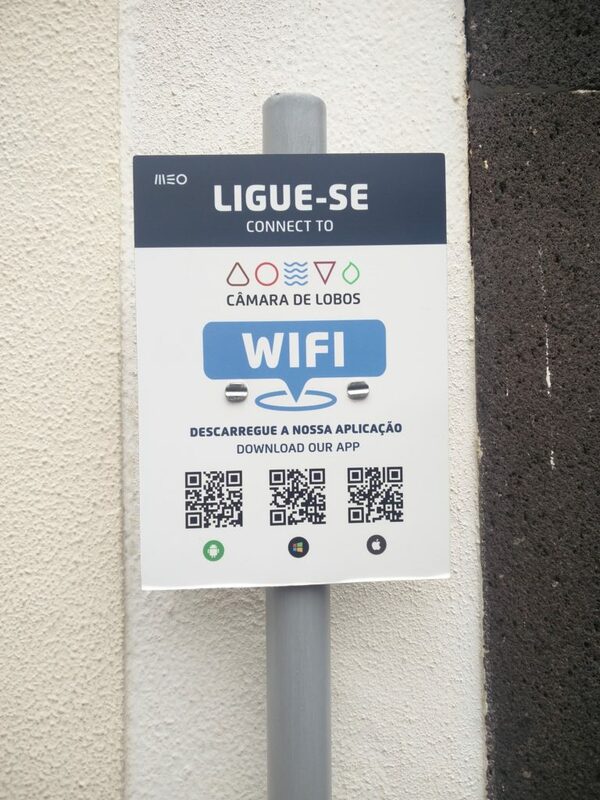 2: One of many signs inviting users—in Portuguese and English—to connect to free wifi available in Câmara de Lobos. Installation of the service and creation of the application cost roughly €31,000, with five initial access points targeting areas with the greatest footfall. As a second set of departure points, we also drew from existing work on collaborative and event ethnography, forms of research that have relied on larger research teams to tackle time-limited or otherwise ephemeral sites—conferences (Brosius and Campbell, 2010), trade shows, state fairs (Paulson, 2009), and, in one case, a day-long taping of British television series The Antiques Roadshow (Weston and Djohari, 2018). While time in Madeira was limited, our field site was less clearly bounded, our group much smaller, more mixed, and less bound by hierarchy or institution. As a result of our self-consciously experimental orientation, there was little sense of what might constitute “success.” We had goodwill, but less common ground—something anthropologist Kirsten Hastrup (2018) discusses as part of reflections on her interactions with a group of biologists and archaeologists as part of a research voyage in northwest Greenland. With no common lexicon and fewer shared assumptions, Hastrup stresses the extent to which cross-disciplinary collaboration relies on those moments in which “the implicated disciplines become visible as human practices, embodied, and emplaced.” (Hastrup, 2018: 317) In such undertakings, the field site itself becomes that which is shared, an anchor and reference point. By opting to meet in the field, “the shared bodily experience of appropriating a landscape together” allows “a drifting of ideas” (Hastrup, 2018: 318), unsettling old certainties. In Madeira, assisting Baía Reis in his 360-degree video work, work which opens “interesting scenarios in the interconnection of image making and emplacement” (Gómez Cruz, 2017: 28), seeing his criteria for suitable material foregrounds some key distinctions between journalistic storytelling and ethnography; between the deliberate, conscious orchestration of meetings and cultivation of story leads, a logic driven by time constraints and the practical difficulties of maneuvering bulky equipment between sites, and a more open-ended, explicitly opportunistic mode of research. Shooting footage, a aggregation of material captured by the camera’s multiple lenses, “stitched” together by software later, we also encounter a tension between the evident expense of the recording equipment and the filmmaker’s desire not to “break” audience immersion by appearing in the shot. Such calculations lead to some awkward scrambling as we attempt to maintain a direct line of sight on the equipment while ourselves remaining concealed behind rocks or landscape features. 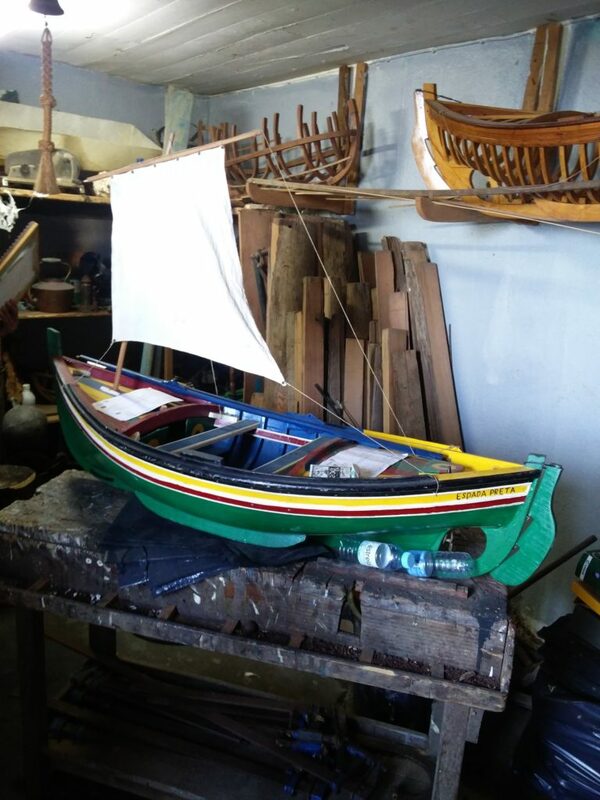 In Câmara de Lobos, we meet with “Bailinha”, a master boat builder resident in Malvinas. Having retired from the shipyard, he now works on other wooden products, primarily for tourists, while making attempts to train a younger generation in carpentry skills. At the time of our meeting, he is threatened with eviction from his workshop in a disused government on the seafront, a space granted to him by a former council leader, to make way for the ongoing development of the bay. Interviewing Bailinha, we then visit his workshop, where Baía Reis sets up a camera to obtain 360-degree footage of the interior, making sure to capture the craftsman in action, using the relevant tools and equipment. WIth the shot level, he closes the door, and steps outside. The audio from the interview will play over this footage, anchoring the story in a particular interior space. Fig. 3: Inside Bailinha’s studio, prior to his eviction. The model boat’s name, Espada Preta, translates as ‘black scabbardfish’, a regional delicacy. As part of our more explicitly ethnographic observations, we visit La Vie Funchal, a four-storey shopping mall in the centre of Funchal, described by one local as a place people go when they want to “escape the island”. Seemingly unconcerned with history or identity, and with little linking it to its immediate surroundings, it is easy to imagine it having been copied and pasted from somewhere else—though, in fact, the architect was Ricardo Bofill, designer of Catalonia’s iconic 1975 public housing project, Walden 7. At the time of our visit, the mall is hosting a temporary exhibition of the island’s first Captain-Majors: João Gonçalves Zarco, Tristão Vaz Teixeira, and Bartolomeu Perestrello. Intended to “acknowledge the men who led the colonization process of these Atlantic islands”, marking and commemorating “Madeira’s 600 years by reviving and reinforcing the connection of community to heritage and its past”; the organising frame has onlookers declare themselves to be the heirs of these men, with cut-out hole pictures, reproductions of exploration instruments including a sextant and armillary sphere, and a model caravel, one of the small sailing ships developed to explore the Atlantic and West African coasts. 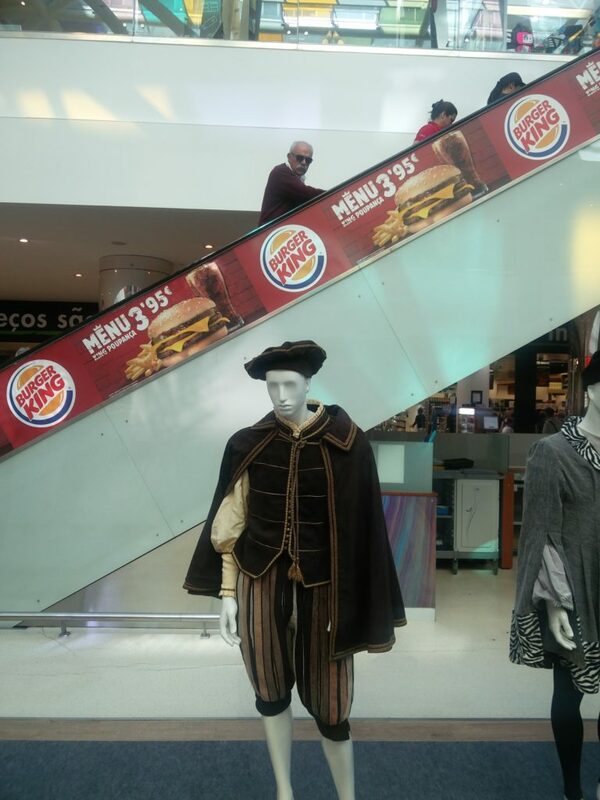 The setting is jarring in its incongruity, with the trappings of Portuguese colonial expansion displayed against a backdrop of escalators, potted palms, and bureaux de change. Fig. 4: Exhibition commemorating the first Captain Majors of Madeira, at La Vie Funchal, part of celebrations marking 600 years since the discovery of Madeira and Porto Santo by the Portuguese. 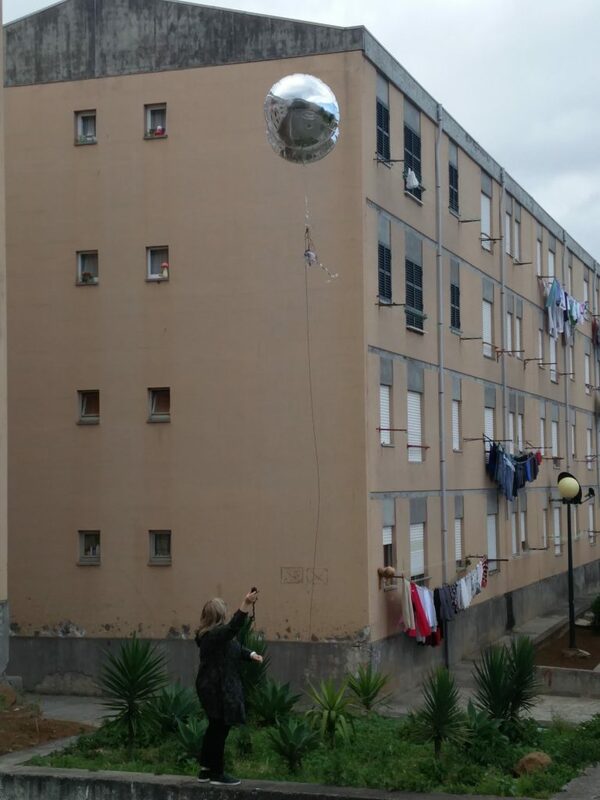 Led by Kasprzak, we attempt an aerial mapping of the Malvinas housing projects, using a balloon mapping kit produced by Public Lab, a Boston-based nonprofit group. First devised as part of a response to the information blackout surrounding the 2010 BP Oil DIsaster in the Gulf of Mexico, capturing hundreds of thousands of digital photos that could be “stitched” together and uploaded to Google Earth, the kit would usually comprise string, protective gloves, rubber bands, zip ties, a carabiner, and 5.5ft weather balloon. Kasprzak’s institution provide a digital camera modified to enable continuous shooting, but we have to supply our own helium balloons—obtained from a Funchal party supplies store, then quickly bundled into the back of a taxi. With official maps and floorplans of Malvinas difficult to come by, but required as a base for the next stage of the art collaboration, our intent is to replace this information with digital aerial photography. Following a YouTube tutorial from a local youth centre’s internet cafe, we assemble a harness and cradle for the camera, sawing through a plastic drinks bottle with a knife. Ultimately, the balloons lack the required buoyancy; with inclement weather and insufficient height, our attempts to guide the barely-airborne device through the neighbourhood is little more than a curiosity for the neighbourhood’s residents. Fig. 5: Balloon mapping in Malvinas. With the “edge” of Cabo Girão as our backdrop, this research prototype certainly succeeded in achieving the experiential “intensity” of encounter recognised by Pink and Morgan (2013). We may not have realised been able to sustain a single collectively-held perspective on this fragmented network of field sites (see Burrell, 2009), but the shared experience of encountering and striving to make sense of a particular landscape helped us to engage substantively with each others’ divergent, often unfamiliar practices of research. Though the organisation of “walkshops”—as an original stated aim—may have proved unworkable, we made the most of the readymade situations and spaces of encounter to which we could most easily gain access. Our limited time in the field was a generative constraint, enabling us to sustain an intensity of engagement that would have otherwise been impossible. Visual material and outputs also had a particularly important role, with Baía Reis’ “immersive” video footage and Kasprzak’s bricoleur assembly of an apparatus capable of producing aerial photography both providing an effective external scaffold and accessible entry point for participation and informant engagement. Baía Reis, A., Coelho, A. F. V. C., 2018. Virtual Reality and journalism. Digital Journalism, ahead of press, 1-11. Brosius, J.P., Campbell, L., M., 2010. Collaborative Event Ethnography: Conservation and development trade-offs at the fourth world conservation congress. Conservation and Society, 8 (4), 245-255. Burrell, J. 2009. The field site as a network: a strategy for locating ethnographic research. Field Methods 21 (2): 181-199. Gómez Cruz E., 2017. Immersive reflexivity: using 360° cameras in ethnographic fieldwork. In: Gómez Cruz E., Sumartojo S., Pink S. (Eds. 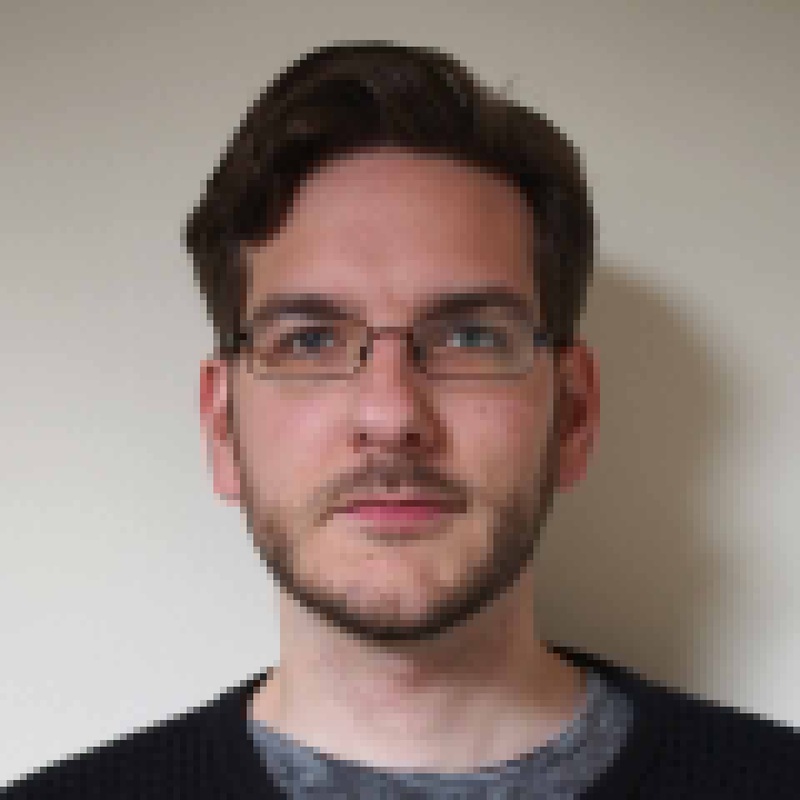 ), Refiguring Techniques in Digital Visual Research, Palgrave Macmillan, pp. 25-38. Hastrup, K., 2018. Collaborative moments: Expanding the anthropological field through cross-disciplinary practice. Ethnos: Journal of Anthropology, 83 (2): 316-334. Jasanoff, S., Kim, S.-H., 2009. S.-H. Kim (2009). Containing the Atom: Sociotechnical Imaginaries and Nuclear Power in the United States and South Korea. Minerva, 47: 119-146. Paulson, K.E., 2009. Ethnography of the ephemeral: studying temporary scenes through individual and collective approaches. Social Identities 15 (4), 509-524. Pink, S., Morgan, J., 2013. Short-term ethnography: intense routes to knowing. Symbolic Interaction, 36 (3), 351-361. Weston, G. and Djohari, N., 2018. Student/staff ‘Collaborative Event Ethnography’ at the Antiques Roadshow. Journal Of Educational Innovation, Partnership and Change, 4(1): 1-7. Wickson, F., Strand, R., Kjølberg, K.L., 2015. The walkshop approach to science and technology ethics. Science and Engineering Ethics 21, 241-264. Michelle Kasprzak is an artist, writer, and curator. 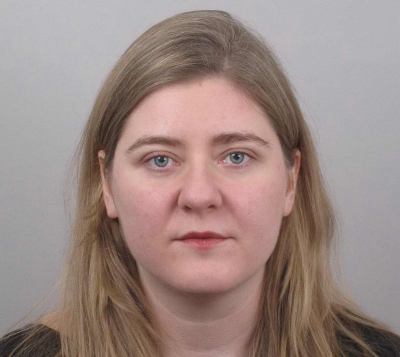 She is currently a PhD Candidate in the Faculty of Engineering at the University of Porto and Madeira Interactive Technologies Institute on the subject of social innovation in extreme scenarios, supervised by Christopher Csíkszentmihályi. She has developed and delivered curriculum for the New Frontiers and Open Design Minor programmes (Willem de Kooning Academy) and the Master’s Education in Arts (Piet Zwart Institute) at Hogeschool Rotterdam. Justin Pickard is a writer and anthropologist. He is currently a PhD Candidate at the University of Sussex’s STEPS Centre, where he is writing a thesis on infrastructure and sociotechnical change in urban India.